“HOPE, FINALLY, defeated fear,” declared Luiz Inácio Lula da Silva upon becoming Brazil’s president 16 years ago. Many Brazilians greeted the election of Lula, a left-wing former trade-union leader who vowed to uplift the poor, with optimism bordering on ecstasy. The government led by his Workers’ Party at first brought prosperity, but its 13 years in power ended in a nightmare of economic depression and corruption. Dilma Rousseff, Lula’s chosen successor, was impeached in 2016. Lula himself is serving a 12-year jail sentence for graft. The fear and rage this caused has ushered into power Jair Bolsonaro, who took office on January 1st. 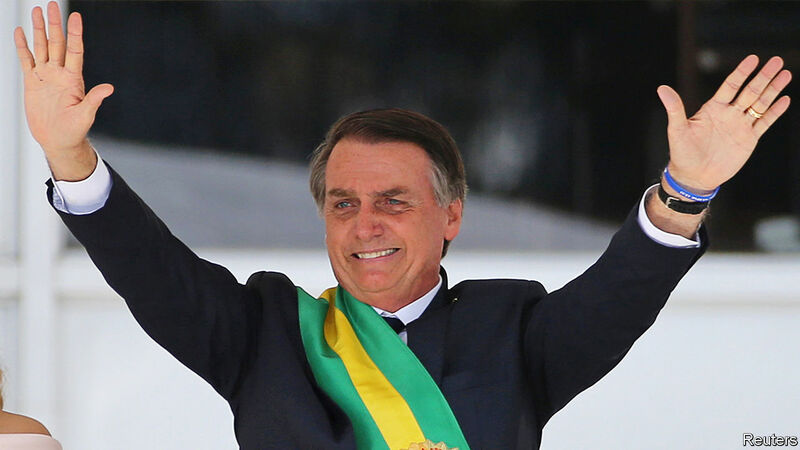 He will be a different sort of president: fiercely socially conservative, a fan of Brazil’s military dictatorship of 1964-85, confrontational where most predecessors were conciliatory. And yet Brazilians greet him with something of the hope that welcomed Lula. Three-quarters say they like what they have seen since his election. On many counts these hopes look misplaced. Mr Bolsonaro had an undistinguished record during seven terms in congress. He often belittles women, has praised the old military regime’s torturers and goads the police to kill more criminal suspects. His new ministers for foreign affairs, education, the environment and human rights all look likely to do more harm than good. Yet in some areas, he espouses sensible ideas. In particular, if he means what he says about the economy and can put his policies into practice, he could end up lifting Brazil’s fortunes. Brazilians are entitled to hope. A cyclical upturn, which has already begun, will help him (see article). Mr Bolsonaro’s other opportunity is to lock in gains Brazil has made in fighting corruption. The scandals that so enraged voters were brought to light mainly by police, prosecutors and judges, especially those in charge of the Lava Jato (Car Wash) investigations of the past four years. Mr Bolsonaro appointed the most prominent corruption-fighting judge, Sérgio Moro, to lead an expanded justice ministry, which will fight crime of all sorts. Mr Moro was the first judge to find Lula guilty. In joining the Bolsonaro team, he opened himself to the charge that he had a political agenda all along. His answer is that the fight against crime and corruption needs better laws alongside the energised judiciary. The new justice minister must now prove that he means it. If Mr Bolsonaro succeeds in reforming the economy and cleaning up Brazil, he could unleash his country’s long-squandered potential. Nothing would give The Economist more pleasure. But to do so he must end his career as a provocateur and become a statesman. He must give up having only a selective respect for the law. And he must stop being lukewarm on pension reform, his government’s most important policy, and give it his full-throated support. Mr Bolsonaro has yet to show that he can tell voters bad news—such as that their pensions are unaffordable—or that he can work with congress. Unless he learns quickly, Brazilians will be disappointed again. Previous PostPrevious Will humans wipe out humanity?